Stan Hilton looked over a young Max Scherzer and he was worried about Scherzer's layoff, according to Baseball America. Scherzer hadn't pitched since college the previous June and now, after a contract impasse with the team that drafted him, Scherzer was playing for independent Fort Worth. "My concern was his command wouldn't be too good," the Fort Worth pitching coach Hilton told Baseball America "First inning he was around the plate, but he was fine. Some of the pitches he threw were electric. As the game progressed, in the second and third inning his command got better." Scherzer was just starting his professional career that year. Hilton was continuing his as a coach, almost a quarter century after his career began as a player. Hilton's career started in 1983, taken by the Athletics in the first round out of Baylor. Hilton's playing career began at short-season Medford and single-A Modesto. He started 12 games between them, going 3-4. He didn't play at all in 1984. He returned briefly to Modesto in 1985, then played at AA Huntsville in 1986. He picked up a win for Huntsville in a June 1986 game. 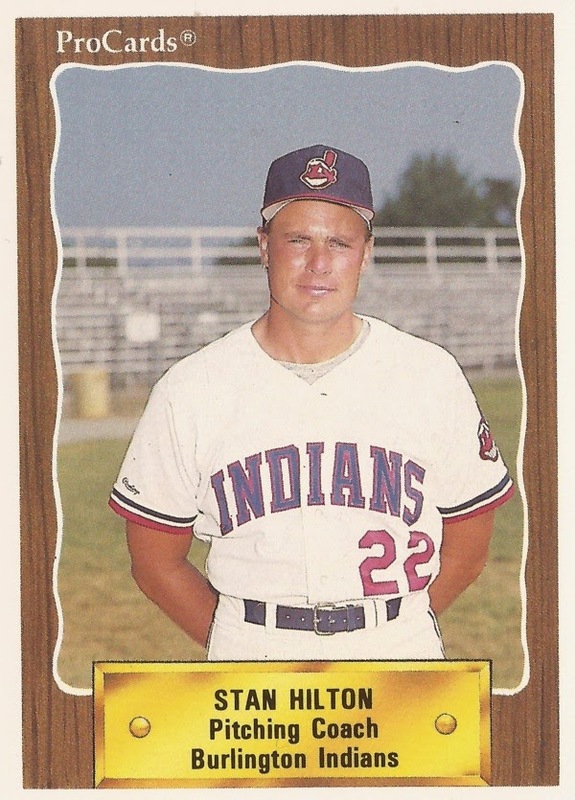 Hilton moved to the Indians system in mid-1987, then made AAA Colorado Springs for part of 1988. His final games came in 1989, back at Colorado Springs, ending his career. Hilton then started his coaching career. Later that year in 1989, he served as pitching coach at rookie Burlington, returning there for 1990 and 1991. Hilton isn't recorded as coaching again until 2004, signing on at single-A Clinton. He stayed there for three seasons. He then served as pitching coach at Fort Worth in 2007 and independent St. George in 2008. In 2006, at Clinton, he praised one of his former pitchers, Jake Rasner, to The Quad City Times. "He had some chances for the game to get away and didn't let it happen," Hilton told The Times, "and that says a lot for him."